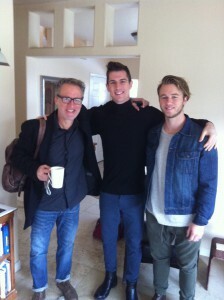 Loved hanging with these guys: Benjamin Courson & Pete Denham! We’re headed out to Sunday services having just returned from the NorCal High School camp. It was phenomenal! Benjamin Courson is one of the best BIble teachers and communicators I’ve ever heard. I’m so excited about what the Lord is doing in his life, and will continue to do in and thru His life! And of course, Pete Denham.. ah, he’s my “Benjamin”- who I love with everything and am so incredibly proud of (as I am all our children as they are all serving the Lord:))! Pete is leading worship and preaching the Gospel in this generation and I can’t wait till he gives his first sermon at Calvary Auburn after Passover in a few months!